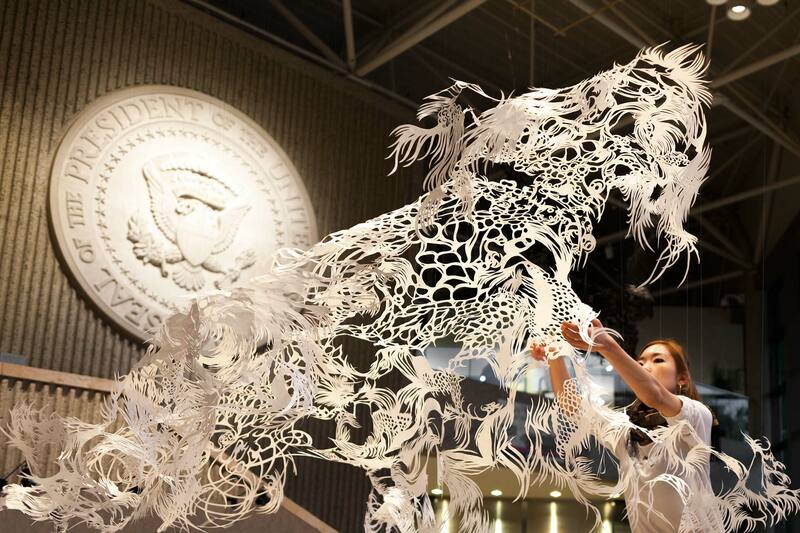 For her debut US Show in Michigan, Nahoko Kojima created a breathtaking show featuring her three most iconic pieces, The Cloud Leopard (2012), Byaku (2013) and Washi (2014) all under one roof. An estimated 230,000 people visited her show at the Gerald R. Ford Presidential Museum. Nahoko appeared live at 5pm on US TV on Oct 7th. in connection with her success as the only non-US Finalist in ArtPrize 2014, leaving a lasting impression on the local community and presenting to them a seldom before seen Japanese Art form in one of the most prestigious venues in Grand Rapids.